Canberra Electrician - TESTIMONIALS Sparks Fly Electrical is Canberra's best electrical service. At Sparks Fly Electrical (Canberra) your feedback is important to us. We take on board all feedback and look for ways to continue our positive attitude toward our work and quality customer service. To submit a customer feedback form, simply complete all fields in the testimonials section below or contact us by email or on 0422 574 463 to have us answer any questions you may have. Viv Ing... Jegayn Ford and his company, Sparks Fly Electrical, has always impressed me since first meeting on a professional basis, on a large contract house in Jerrabomberra NSW. His work ethics and quality of work are something that is rare to find in this day and age. It is based on these values that I have no hesitation in recommending Sparks Fly Electrical, to take on any electrical work needed to be performed. The final results will be his testament. Mr Viv Ingold. Sole Director Ingold Constructions Pty Ltd.
Dave Joi... How lucky I am to have found this electrician. Don't go else where cause these guys provide quality service and excellent prices. I am a happy customer who found this business by word of mouth. Well done. Garry Jon... Great prices and expert advice. Top electrical service. Dave Cro...Jay at Sparks Fly was brilliant. Getting an on line quote was simple and quick. Jay then organised a time to fix my overhead fan in my kitchen and a faulty light setting in my toilet. Jay's service was quick and efficient. His manner pleasant and his prices very competitive. I would recommend Jay at Sparks Fly Electrical to anyone. Lyn Mon...I have had total satisfaction with Sparks Fly Electrical. They have been efficient, prompt and professional in attitude whenever I have asked for their services. Mick Ada...Jay, must be a common theme with rain, added a powerpoint to service the recently installed NBN connection with no fuss. More than happy to work around my availability. All up a great effort will be using Jay again in the future! Anthony Hog...Jay supplied us with a very professional and courteous service recently when installing several new power points around our home. Jay was punctual, friendly and great value for money. He provided excellent advice on placement and we would definitely use Sparks Fly again for any of our electrical needs. Lincoln Svi...Fantastic work completed quickly, professionally, to a high standard and for a great price. We cannot recommend Jegayn and Sparks Fly highly enough. Jegayn made himself available on such short notice which was really appreciated and we will definitely be contacting him first for all electrical requirements that we have in the future. Thanks again! Christine Mai...Would readily recommend Sparks Fly. Had a fan installed in my unit, and 100% satisfied. Good communication, accurate and fair quote. Thank you Jegayn. Eileen Sch…Very happy with the service provided by Sparks Fly. Very professional and priced within quote. Will use them again. Barton Pub…Sparks Fly have helped me out twice and done a fantastic job with my exhaust fan and faulty light fittings - all fixed quickly and simply! Thank you! Leanne W...Thanks Jay. My experience with Sparks Fly Electrical has been great. I, as a rule, aim to get several quotes for any job I am doing. Jay's reply to my online request was prompt, with a call to confirm the requirements and advise the fees. It was not the cheapest quote, but as another tradie pointed out, lower fees doesn't always mean a lower cost job in the end as this work is based on time. Jay is very efficient and methodical in how he approached the work and as such is excellent value for money. As an Interior Designer I look forward to working with Jay and his team in the future as not only are they good value but also their company aligns with our ethos of delivering ethical, affordable, sustainable outcomes. James All…All installations and repairs were carried out promptly, satisfactorily and at an reasonable cost. So that is another business card that I will definitely be retaining for future use. Megan Coo…I cannot fault sparks fly...We have been renovating since April and the only person I can truly rely on is Jay. He always arrives on time, prepared, completes the job and tidies up. He has had to deal with the challenges of renovating an old home but just works through the issues methodically and professionally. He is one in a million, so rare in the building industry and at times has made us laugh under difficult living conditions. Thank you Jay. Angelo...J - came - he saw - he fixed. Accompanied by a very good work ethic and a very pleasant and sociable approach. Courtesy and customer service is the name of the game in any business and Sparks has it. Highly recommended. Will M...Got Jay to install a spotlight and a few downlights in the kitchen. Arrived early, got the job done well in the time he thought it would, fantastic. Very pleased with the service and workmanship. Many thanks for the efficient and effective work, highly recommended. Nicole...Excellent service. Honest and reliable. Highly recommended. Tori...Fantastic job, very quick turnaround at a busy time of year, professional and friendly. Really appreciate it and would highly recommend Sparks Fly. Thanks. Jarrod Woo...Sparks Fly Electrical have done three jobs for me now - light installations and a heater removal with some plastering. Jegayn was punctual, very professional and his workmanship is excellent. I was billed correctly and on time. I am planning on using Sparks Fly again for another job when I find what I want installed and would not hesitate to recommend them to friends or family. Adam Kir...Very responsive service. I will use Sparks Fly Electrical again! Jason Bus...Excellent result on 05/04/2016 with work completed within the quoted duration/cost and additional work done at a very good price. Mik...Looking for an electrician and not sure "...who ya gonna call?" Try Sparks Fly, they were on time, efficient and effective. Joh...Was extremely happy with not only the work carried out. But for jay to come out at 9.00 o'clock at night and repair what he could . And then come back and replace board. Thanks once again. Mark Nor...Jegayn did a great job installing a plug and socket for my NBN box so I no longer have an extension cord hanging down the wall. His costs were very reasonable too. I definitely will use Jegayn if I have any more electrical work to be done. ​Penny Rix...Jay from Sparks Fly Electrical was awesome. He was so prompt on returning my call, turned up on time, correctly diagnosed the issue and followed up with me after the work was done. I normally wouldn't bother writing a review but I was so impressed and happy with his professional service, I would happily recommend Sparks Fly to anyone. Robert Her...Jegayn, is the best electrician we have ever contracted. He is a great problem solver with an eye on what solutions will cost you before you commence the work, and best of all no surprises. He is also a top bloke. I cannot recommend him highly enough after the many jobs he has done for us on time and within budget. Julie…Prompt and efficient. This guy knew his stuff. Will definitely use again. Peter Wil...Jay arrived yesterday to replace a powerpoint and remove one. He was thoroughly professional and very friendly and explored a variety of options before the final decision to remove the unnecessary powerpoint. I was extremely pleased with the service and would have no hesitation in recommending Sparks Fly and contacting them again for any future electrical work. Thank You! Frank and Meg McK...Jay's advice was what we needed. The new lights were supplied and fitted in no time. Terrific service. Margaret Gou...Excellent job. Great customer service. Cherie & Peter Fla...Provided a very professional service. Price very fair. Would recommend. Jerry...Jay did a good job at a very fair price. Recommended. Julia Jon...Great company. Sticks with it until the job is fully done. I’d recommend them to anyone. Jay moved my Foxtel in the middle of a rain storm. Jay was not deterred about the onslaught of wind and rain he kept working and finished the job. Jay was soaked from head to toe and I mean dripping wet. This shows the dedication and motivation to the job at hand. I fully recommend Jay and Sparks Fly to any one needing a reliable and genuine tradie, who will get the job done. Samir Bel...One of the best tradesmen I have dealt with! Sparks Fly was reliable and accountable. Would arrive on time and made sure the job was done to the highest standard. I would recommend Sparks Fly Electrical to anyone who wants a reliable, professional and easy to deal with electrician. Thanks again Sparks Fly, you have been great! Adele Noa...Jay updated the main switchboard in my house and installed lighting to my new garage. Great price, excellent service. I will be using him again! Iain Ham...Friendly, fast and great prices! Highly recommend Jay. He had a great phone manner, called us back quickly and was able to do our job in just a couple of days after we first enquired. Where other tradies said it was too hard, in about 2 hours Jay was able to cut out the holes and install our decking lights. Now our entertainment area looks fantastic. Even cleaned up as well. Plus, he had no problem with our two dogs, meaning we didn’t have to lock them up. Could not speak more highly of him. John Cou...I contacted Jegayn from Sparks Fly on the recommendation of Project Lighting. He came and installed the bathroom lights (Tastic) and the ceiling fan in the bedroom. I am always nervous using new tradesman as I have had some real cowboys over the years. Jegayn was completely professional, clean and tidy. He did the job very well and I have booked him already to do the next job. Brian Joh...We were very pleased with your efficient and effective service in putting in two new Tastic lights for us. Megan...Many challenges but Jay came up trumps every time. Thank you from all of us. Peter Fak…We're so impressed by Jay's workmanship that our entire team has now hired him. Moreso, now my boss, and my mother in law are about to call for further work. Christine Bar...I contacted Jay on the recommendation of Project Lighting. We had a lot of work to be done and it was done speedily, professionally at a very good price. We are delighted with the result. We had one non-standard job and Jay came up with an excellent and ingenious solution for us. Nothing was too much trouble. Would recommend Sparks Fly to anyone seeking a quality job done by a friendly professional. Thanks! Lea…Was very pleased with the service provided. Jay is professional, punctual and knows what he is doing. Thanks for your work. Scott M...Prompt, reliable and efficient service. Thanks Mate. Racheal...I had a couple of lights to be installed and we weren't sure if it was going to be possible but Jay did a fantastic job at a very reasonable price. It didn't take long. He made it look very easy (although I'm sure it wasn't). Extra light switches were ordered and delivered on the spot making it all very straight forward. Jay's a friendly and professional guy and I would certainly use this company again. Peter Fak…I have used Jay a couple of times now and have found his work to be fantastic. Can't recommend him highly enough. Tony Har...Jay was very prompt in answering my call and providing a quote. He gave us a day and time to fit the work in. On the day he arrived on time and the work was carried out to our satisfaction. Jay has a great personality and really runs a great business. We have had so many problems getting a sparky to even quote or turn up. I would highly recommend Sparks Fly Electrical. Lynne Aud...Sparks Fly was quick to organise an electrician to fix my small but annoying electricity problems. Jegayn was friendly and efficient and easy to work with. Thank you! 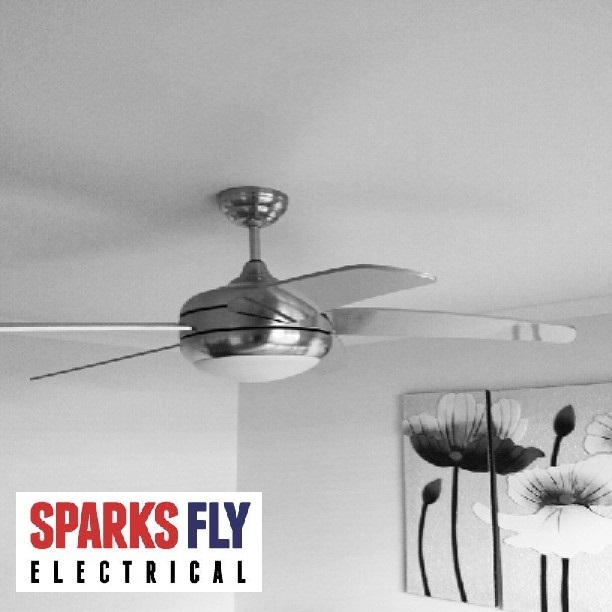 Melanie Bla...My Father and I were extremely happy with the service, honesty and professionalism of Jay from Sparks Fly Electrical. In every dealing we had with him he was upfront and helpful. Jay did a fantastic job and we would certainly use this business again. Thank you Jay! Gordon Hen...Knowledgable, efficient and really good value for money. I would recommend Jay. Baldwin Distilling Company...One of the best trade experiences I have had! Sparks Fly were upfront, professional, friendly and their work is quite literally the best! Looking forward to a long business relationship. Kate Pau...Thanks again for fast and efficient service! Erin Gre...Sparks Fly had great customer service. They were very friendly, came around and completed the job while I was at work and gave me a follow up call when I got home. They did a great job, would happily recommend. Leo...Your service was fast with good communication. I will keep you in mind for the future and recommend you to my friends. Thank you. Sen...I am happy with the end result of the lighting in my family room and security light outdoor . On time and a highly professional job. I would not hesitate to recommend. Bronwyn Bun...Jay was very polite and came when he said he would. He conducted himself in a very professional manner and explained what he was doing so that I could understand. He arranged further service from ActewAGL on my behalf which I really appreciated. Highly recommended electrician. ​Jane Bar...Very fast response to our call to fix our smoldering electricity box. The electricity was working again when we returned home in the evening and we were very happy with the friendly and efficient service offered by Sparks Fly Electrical. Satish...I'm very pleased with the service I received from Jay. He charges very reasonably unlike other electrical contractors. I highly recommend him and more than happy to use for any future electrical work. Karen Mcq...Jay has done three jobs at my house, every time arrived on time, always rings before hand to let you know on the way. His workmanship is excellent and very knowledgable in regards to lighting placement too. He is a friendly, funny guy and would highly recommend Jay for any job big or small! Raramayi Tsi...Excellent work Jay. I won't hesitate to contact you for more electrical jobs around my house. Thank you so much for cleaning after yourself. Des...Thanks, Jay, for your work on my telephone and internet issues. You were clear in identifying the problem and documenting it so I could take up the fight with my internet provider. Thank you also for coming back to fix minor issues identified by the provider. Ursula Hew...Highly recommend Sparks Fly Electrical. Very friendly, efficient and helpful. Had a minor electrical issue which was solved via phone conversation. His advice save me time and money. Phil Hol...Jegayn is a true professional, arrived when he said he would, fixed the problem with no hassle or fuss. Can't thank him enough and highly recommend him!! Penny Rix...Jay from Sparks Fly Electrical was awesome. He was so prompt on returning my call, turned up on time, correctly diagnosed the issue and followed up with me after the work was done. I normally wouldn't bother writing a review but I was so impressed and happy with his professional service, I would happily recommend Sparks Fly to anyone.